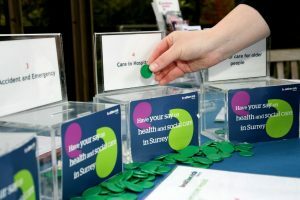 We hold events in the 6 Clinical Commissioning Group locations across Surrey every 3 months to make sure that we hear from you in GP Surgeries, Hospitals, Community Hospitals, Dentists, Opticians, Day Centres, Care Homes, Supermarkets, High Streets, Family fun days, Community Centres, SureStart Children’s Centres, Support Groups and many other community groups. We aim to work with other organisations in the community to make sure we share our opportunity to get feedback in the local areas we visit, because we know that local knowledge is understanding how things work on a practical level. We have different ways of engaging with people to make sure that everyone gets an equal opportunity to share their experiences in the way that they are most comfortable. To keep up to date with our latest reports, check out our project report page. As well as our listening events, we also hold Community Outreach Workshops to hear from people in Surrey who are seldom heard. We do this by attending groups in the community to hear about what it’s like to access health and social care when you have specific needs. Our workshops start with an engagement officer explaining who we are, what we do and how we use the experiences we hear. We then ask some open questions to stimulate discussion and note down the experiences that people in the group wish to share. At the end of the workshop we make sure everyone understands who we will share their experiences with and make sure to get consent from each person who has shared their experience. We leave the group with complimentary leaflets, pens and wrist bands so that if anyone in the group would like to contact us they have our details. 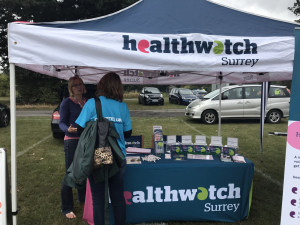 If there is a group in your local community that could share experiences of health and care, please email engagement@healthwatchsurrey.co.uk to arrange a Community Outreach Workshop.